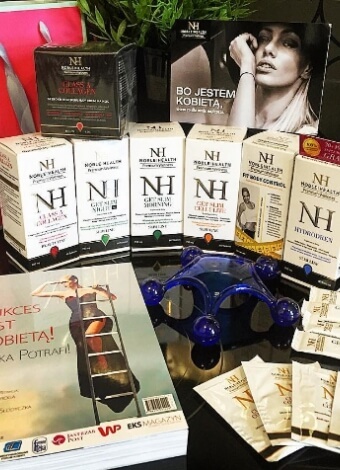 Night Cream Class A Collagen - Natural dermocosmetics and dietary supplements. Collagen creams. Unique formula with collagen, vitamin E, panthenol and stem cells from grapes. It regenerates the skin structure during sleep. It restores the skin’s elasticity and radiance. It alleviates and soothes skin irritation that you get during the day. Class A Collagen night cream contains the following ingredients: Aqua, Glycerin, Dicaprylyl Carbonate, Isostearyl Isostearate, Cetearyl Alcohol, Propylheptyl Caprylate, Isopropyl Myristate, Butyrospermum Parkii Butter, Vitis Vinifera Seed Oil, Glyceryl Stearate Citrate, Cyclopentasiloxane, Glyceryl Stearate, Cetyl Alcohol, Potassium Cetyl Phosphate, Cetyl Behenate, Behenic Acid, Soluble Collagen, Biosaccharide Gum-1, C30-45 Alkyl Cetearyl Dimethicone Crosspolymer, Panthenol, Butylene Glycol, Tocopheryl Acetate, Vitis Vinifera Leaf Extract, Glycine Soja Germ Extract, Triticum Vulgare Germ Extract, Sodium Hyaluronate, Vitis Vinifera Callus Culture Extract, Acrylates/C10-30 Alkyl Acrylate Crosspolymer, Sodium Hydroxide, Allantoin, Phenoxyethanol, Ethylhexylglycerin, Sodium Benzoate, Potassium Sorbate, Disodium EDTA, PEG-8, Tocopherol, Ascorbyl Palmitate, Ascorbic Acid, Citric Acid, Parfum, Hexyl Cinnamal. 1. Who is Class A Collagen night cream designed for? Class A Collagen night cream is a dermocosmetic designed for those who wish to take care of the skin of the face condition. It’s a professional cream for normal, dry, sensitive and allergy-prone skin. 2. What’s the composition of Class A Collagen night cream? 3. How do the ingredients of Class A Collagen night cream act? 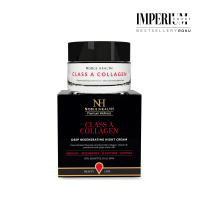 Class A Collagen night cream has a triple regenerating action that directly bonds water molecules in the deep layers of the skin and restores proper moisture of the epidermis. Due to the concentrated formula with sea fish collagen, vitamin E and panthenol, it provides the skin with essential ingredients thus improving its elasticity. Regular use of the cream slows down the aging process of the skin and lets you preserve a youthful and radiant appearance. In the morning, it leaves the skin refreshed, rested and velvety to the touch. It’s professional care designed by experts to be used in the privacy of your home. 4. How to use Class A Collagen night cream? Massage Class A Collagen night cream every evening into the clean skin of the face, neck and neckline with gentle, circular movements. Apply the cosmetic with fingertips from the center of the face outward in the opposite direction to gravity, i.e. from chin to forehead. 5. How to store Class A Collagen night cream? Class A Collagen night cream should be stored at a temperature between 5˚C and 25˚C. 6. What’s the capacity of Class A Collagen night cream? Class A Collagen night cream has a capacity of 50 ml. Cream is fantastic! A colleague bought me a gift and it was a bull's-eye! I recommend !!!!! Super creams, I tried the one for night and I recommend it in 100%, in the morning the skin is soft and moisturized. The cream is simply sensational !!! It is absorbed wonderfully, it moisturizes the skin well, it's definitely in better shape, more radiant. I highly recommend ! !